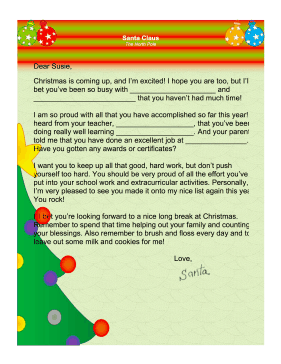 This free, printable, fill-in-the-blank letter from Santa Claus praises the child's recent accomplishments at home, in school and in extracurricular activities. Christmas is coming up, and I'm excited! I hope you are too, but I'll bet you've been so busy with _____________________ and _________________________ that you haven't had much time! I am so proud with all that you have accomplished so far this year! I heard from your teacher, ___________________, that you've been doing really well learning ___________________. And your parents told me that you have done an excellent job at _______________. Have you gotten any awards or certificates? I want you to keep up all that good, hard work, but don't push yourself too hard. You should be very proud of all the effort you've put into your school work and extracurricular activities. Personally, I'm very pleased to see you made it onto my nice list again this year. You rock! I'll bet you're looking forward to a nice long break at Christmas. Remember to spend that time helping out your family and counting your blessings. Also remember to brush and floss every day and to leave out some milk and cookies for me!